What do you do when you purchased a bottle of wine that you really just don't love? I know, first world problems. Be that as it may, I had several bottles of a wine that I just really didn't like. Before you label me as some wine diva…let me dispel you of that notion. We are in a wine club and my typical qualifier when I order wine is ‘around $10 a bottle'…so I'm not some high-fallutin wine drinker who only has to have some varietal that has been sitting in some underground wine place for 100's of years. I'm pretty simple…I just don't like real acidic wines…and this wine was pretty acidic…and I had several bottles of it. I used one bottle of it when I made my Meyer Lemon and Dried Fig Conserve...which by the way is HEAVENLY. Before we dive in to the recipe, let me give a little disclaimer here. I will experiment with just about ANYTHING, except when I am canning. There is a part of me that thinks that the USDA might be a tad overboard on putting the fear of God into everyone when it comes to canning, but botulism is a real thing and I'm not one to tempt it. So, when I ‘invent' a canning recipe, I usually rely pretty heavily on tried and true sources, only altering those things that don't effect Ph which is especially important when water bath canning. High Acid Foods (those with a Ph of 4.6 or lower) are safe for water bath canning, while those low-acid foods (Ph greater than 4.6) must be pressure canned due to the ability to reach a higher temperature to kill off any molds, bacteria and yeasts. So for this recipe, I leaned on Benardin's Wine Jelly Inferno, taking a little creative license, in a non-Ph altering kind of way, of course. You know those times when you just need a quick appetizer? Keep a jar of this Jalapeno Pepper Jelly and you will surely take your ‘cheese and cracker' routine to new heights! Trust me, you will keep finding new ways to enjoy this hot pepper jelly recipe! Some of these are affiliate links and I will earn a small commission off of the sale of these products, but the price you are charged is not affected. You can see my full disclosure policy here. Jars: Lately I'm loving Weck Jars, but I also like to use Ball Jars. Jalapeno Pepper Jelly is perfect on cheese, meats and makes the delicious bacon. This hot pepper jam will satisfy your wine pepper jelly cravings. Prepare canner, jars, and lids. See The Ball Complete Book of Home Preserving for guidance. If you are using Weck Jars, I do boil the glass jars and lids for at least 10 minutes and put the rubber rings separately in boiling water for 2-3 minutes. After the 2-3 minutes, I leave the rings in the hot water until ready to use them. Put a plate with 4 spoons in the freezer to be able to check the gel state of your jelly. Mix 1/2 cup of sugar with a package of pectin. Stir in pectin/sugar mix and whisk well until fully dissolved. Add chopped peppers and remaining sugar and whisk well until sugar is dissolved. Stirring frequently, bring to a rolling boil that can't be stirred down. Boil hard for 2 minutes. Turn off heat and add balsamic vinegar. Stir well. Put a dollop of jelly on your plate and put back in freezer for 1 minute. After a minute, if you can push the jelly and it wrinkles, it is done and ready to be canned. Remove air bubbles and wipe rim with white vinegar. Center lid on jar and screw band down until resistance is met, then increase to fingertip tight. Or, if using Weck Jar, place rubber gasket, glass lid and metal clips on the jar. Place jars in canner, making sure they are completely covered with water by at least one inch. Boil for 10 full minutes, or adjust for altitude via Ball Complete Book of Home Preserving. The time to bring your pot to a boil should not be counted in the minute boil time. Remove your jars from the pot and let them sit, undisturbed for 24 hours. Your Ball/Kerr jar lid centers should pop down when sealed and the orange tab on the Weck jars will slightly curve down. Now...here's where I might have gone off of the USDA reservation a bit...and it's completely up to you on if you want to follow me. Most likely, unless you have been blessed by the canning fairy who skipped over me, your peppers will be floating at the top of your jelly. The USDA would recommend that you just let it be and stir it up when you open the jar. Once I knew that my jars had sealed, within a half hour of removing them from the pot, I shook them a couple of times to disperse the pepper pieces throughout. I chatted with a representative from Ball who told me the risk of doing what I did was that I might cause the seals to break. I checked my seals and they were still intact 24 hours later, so I am not concerned. I am not recommending anything...just telling you what I did. I'm sure a lawyer would advise me to tell you to do so at your own risk or something to that extent. Consider yourself told. This recipe assumes some knowledge of proper and safe canning techniques. Please see the Ball Complete Book of Home Preserving for guidance. For what it's worth, the next time I make pepper jelly, I will probably swap out a couple of jalapenos for serrano peppers. I would like a tad more heat and don't think I can get that by just adding more jalapenos. This is a personal preference of course. You can check out the relative heat of different peppers on a Scoville Chart like this one. OK…you have your Jalapeno Pepper Wine Jelly…now what? What an I gonna do with this Jalapeno jelly? Of course, it's perfect on just about any cheese. My preference is a hard cheese, like Gruyere or Manchego. But I know there are many who love a good Jalapeno Pepper Jelly on cream cheese, as well as Brie. Use it in a vinaigrette as a substitute for honey or sugar. And maybe my all time favorite…Make Bacon Candy! Simply smear some Jalapeno Pepper Wine Jelly over your uncooked bacon and pop into 325′ oven…20-30 minutes for thick bacon, 10-15 for thinner. Watch carefully…the sugar in the jelly will burn quickly. Hmmm…hot pepper jam and bacon? Yep! So…when I stop and think of the many pluses of blogging, making and eating bacon candy for breakfast and lunch today will surely top the list of ‘great things about blogging'. Coincidentally, it also tops the list of ‘the perils of blogging'. 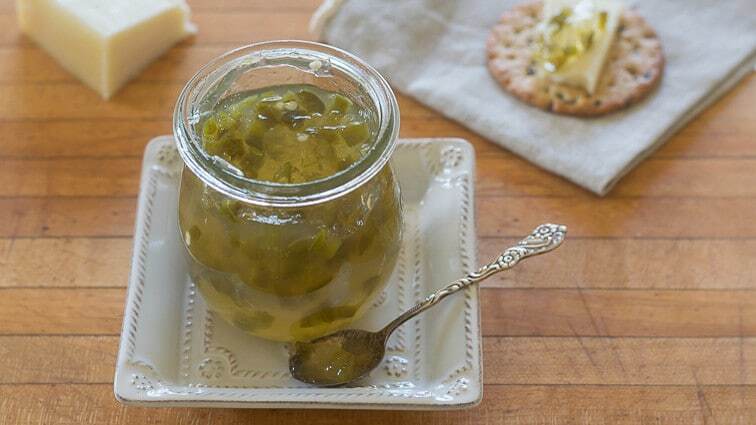 Need to see this Jalapeno Pepper Jelly recipe in action? Here it is…. 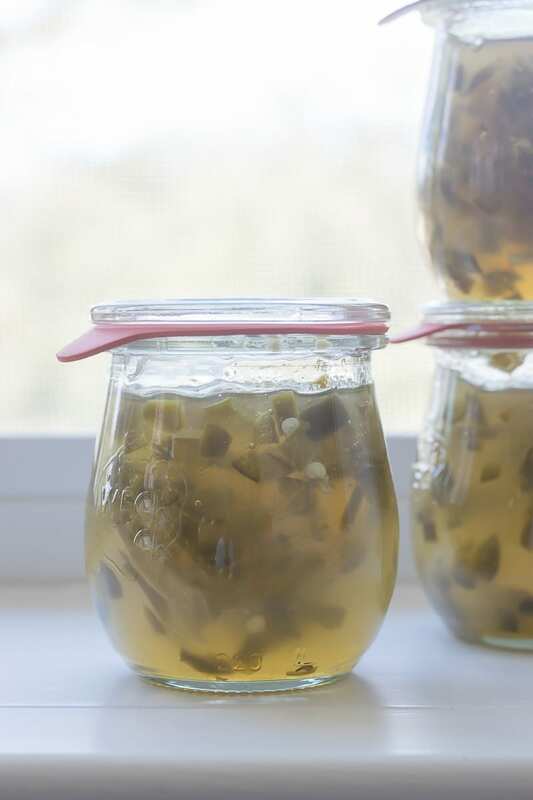 Want to save this Jalapeno Pepper Jelly Recipe for your future reference? Either bookmark this page or pin the following image. You can also access all the products I referred to in this post on my brand new Nourish and Nestle page on Amazon. You can access it here. My hubby and I love jalepano jelly. Looking forward to trying this recipe. I’ve done a habanero before which was a big hit. The sweet and hot are a great combination. Hi Theresa…I think the next time I make this I will use either habanero or serrano..just for the added bite…this is more on the mild side…but I know that’s subjective. This sounds perfect for home and a hostess gift, and agree with you about canning safety. Could I use a White Merlot or White Zinfandel? Yes, you could absolutely use a blush/rose wine. Think it’d be lovely!! I would add a little more vinegar since I’m not sure that the white merlots or white zins are as acidic as the Sauvignon Blanc that I used. Thanks so much for ‘being there’ when I send out my posts! I know I enjoy writing them, but it surely wouldn’t be as much fun without people like you out there. Wishing you a lovely day my friend! You keep sending these great recipes for jams and jellies and all their cousins. The latest one I tried was the Jalapeno Wine Jelly. Had to make it with less heat so I used a big Cubanelle Pepper along with red, yellow, and orange bell peppers. Also used a Sauvignon Blanc as the base and Splenda. It turned out great, the flecks of the 4 pepper colors was beautiful. Like you I had to get the peppers mixed in for an even suspension (or close to it). Taste is out of this world, and I gave away samples from the end of the batch to friends, along with suggestions of what to put it on. I love the idea of spreading it on bacon. You are such an inspiration, keep the recipes coming. This 1 is no less than 5 stars. I read your message and got a fantastic case of the all over smiles! Your virtual pats on my back keep me going and keep me loving what I do! Thank you so much for taking a few minutes to write in. I love the idea of using it with Splenda! How much did you use? I know you are now very popular with your friends…you’ve set a high bar and now they are going to expect additional jars! Get busy canning!? And you MUST try it on bacon.